While searching the abandoned World’s Fair grounds for signs of the Shredder and Krang, the Turtles see a strange light coming from inside a building. They enter only to stumble upon a dimensional portal. The portal deposits a strange high-tech cylinder with weird carvings around it. Donatello goes to inspect it, accidentally activating the device. 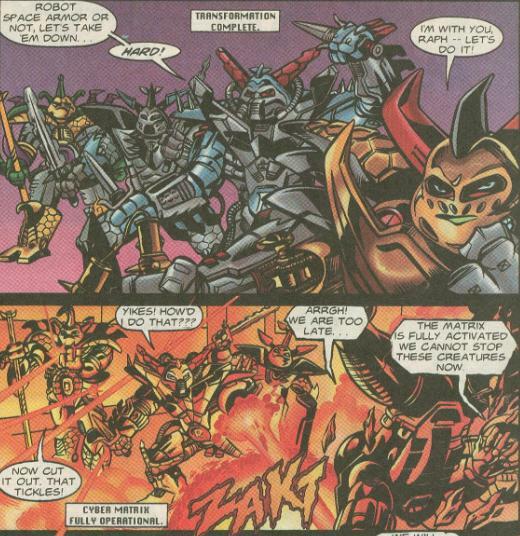 It then blasts the Turtles with energy beams, bonding weird gauntlets to their hands. Suddenly, a squad of helmeted, gun-toting storm troopers comes swarming out of the portal and attacks the Turtles, demanding the return of the “Cyber Matrix”. The Turtles fight back ninja-style, but gradually the gauntlets begin to spread cybernetic armor all over their bodies. Now fully-armored, the Turtles use their grafted-on laser guns and new upgraded weapons to drive the bad guys back into the portal. Next, a teenage girl comes stepping through. She introduces herself as Mol-Kellal, a freedom fighter from another world. The Dhrall Empire (the storm troopers) invaded her world and launched her people's planetary defense grid, the Cyber Matrix, into the dimensional void. A small band of freedom fighters have been searching for the Cyber Matrix ever since, while the Dhrall Empire have been trying to exterminate them before they could succeed. Kellal thanks the Turtles for safeguarding the Cyber Matrix. The device then recognizes her and the Cyber-Armor is transferred from the Turtles and to Kellal. She then transforms into a humongous robotic warrior. Thanking the Turtles once more, Kellal journeys back through the portal to go free her people. Now left alone in an empty building, Leonardo, Donatello and Michaelangelo wonder just what the heck that was all about. Raphael drolly gives them the Reader’s Digest version, basically summing it up as one in a million similar adventures that they’ve had. Content with that, the Turtles then leave to go find some “real” action. *Although Krang is mentioned, the Cyber-Turtle Armor is given different origins in both the Fred Wolf cartoon (the episode “Cyber-Turtles”) and TMNT Adventures (TMNT Adventures #62), meaning this comic takes place in neither continuity, but off by itself. 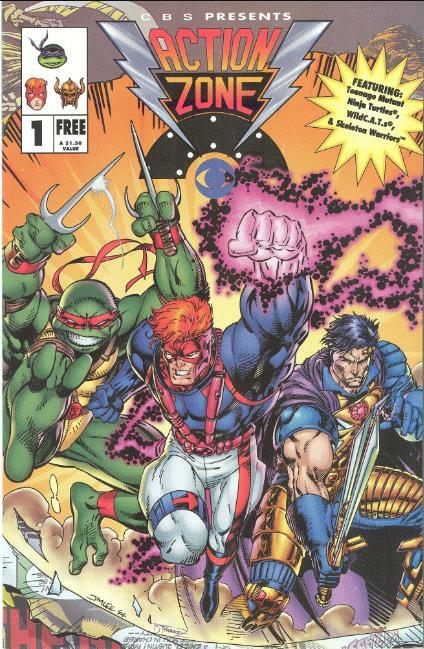 *CBS Action Zone #1 also contained stories for the CBS cartoons “WildC.A.T.S.” and “Skeleton Warriors”. *The cryptic advertisement in this issue for “TMNT: The Next Mutation” is not for the 1997 live-action television series “Ninja Turtles: The Next Mutation” but for a fourth live-action film that never saw production. For more on that, see this article. If it weren’t for the Michael Dooney art, I probably wouldn’t care much for this thing, but the overall presentation of what is essentially a Playmates action figure pack-in comic is astonishingly impressive. 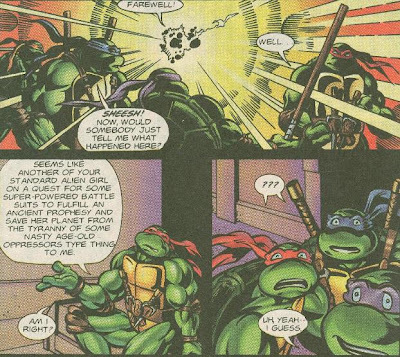 Though Dooney can’t help how stupid the Cyber-Turtles look, his pencils are still very dynamic while Berger’s dark and heavy inks with Lavigne’s lavish coloring make this easily the most impressive strip in the CBS Action Zone anthology (admittedly, that isn’t the highest compliment, but still). It’s a far more attractive presentation than this sort of story deserves, that’s for sure. In regards to the CBS Action Zone, by 1994 I think I watched the Fox Kids Saturday morning cartoon block almost exclusively. I was out of my TMNT phase at the time and into my X-Men phase. Fox Kids had X-Men, Spider-Man, The Tick, Tiny Toon Adventures, Eek the Cat, Batman the Animated Series… There just wasn’t any need to change the channel. And yeah, I watched Mighty Morphin’ Power Rangers, too. Sue me. So the CBS Action Zone programming pretty much came and went with nary a notice from me. I do recall glancing at WildC.A.T.S. once or twice because I recognized the comic, but I never devoted myself to that show. And though I’ve come back to them as an adult, in '94 the Ninja Turtles were passé at my elementary school (and the show was in its death-throws at this point, anyway). I also vaguely recall flipping over to ABC once or twice and catching their competition: Free Willy the Animated Series and Bump in the Night. Yeah. Fox Kids kinda dominated Saturday mornings in the 90s for a reason. Anyway, the only other thing to say about this free giveaway comic for kids is that it had an advertisement for Casey Jones & Raphael #1. And if you’ve ever read that book, you’ll understand why this is hilarious. Fox Kids Saturday morning= the most influential programming block in many a kid's childhood. Honestly, I don't think that lineup you listed was ever bested before or since. I did like Bump in the Night, though.